Excellent little boozer just around the corner from Mansion tube. Small front bar with a back room for sitting. Food is standard English pub grub usually served by a tasty bar girl and very nice to (the food that is). 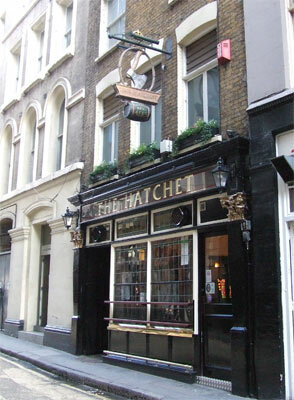 This is a lovely traditional pub in the City, although you do get city gents, they are likely to be the real ale type. On occasion there have been ladies on this side of the bar. Overall, down-to-earth, lovely venue. Being Greene King you are assured the excellance of ale and The Hatchet does not let you down, all the beers are kept in perfect condition, thanks to the dedication of Pat, the landlord. Turn left outside The Hatchet and heading down Garlick Hill within a few yards of Upper Thames Street you will find the church St. James' Garlickhythe, rebuilt to the designs of Wren after the Great Fire and erected for the modest sum of £5,357 12s 10d. The tower of this churs is justly regarded as an example of Sir Christopher Wren's most distinctive work.